An energetic, lyrical, genre-defying account of the 2017 tennis season. In The Circuit: A Tennis Odyssey, the award-winning poet—and Paris Review sports columnist—Rowan Ricardo Phillips chronicles 2017 as seen through the unique prism of its pivotal, revelatory, and historic tennis season. The annual tennis schedule is a rarity in professional sports in that it encapsulates the calendar year. And like the year, it’s divided into four seasons, each marked by a final tournament: the Grand Slams. Phillips charts the year from winter’s Australian Open, where Roger Federer and Rafael Nadal renewed their rivalry in a match for the ages, to fall’s U.S. Open. 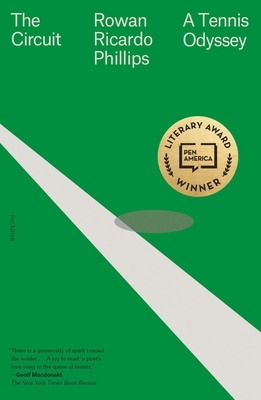 Along the way, Phillips paints a new, vibrant portrait of tennis, one that captures not only the emotions, nerves, and ruthless tactics of the point-by-point game but also the quicksilver movement of victory and defeat on the tour, placing that sense of upheaval within a broader cultural and social context. Tennis has long been thought of as an escapist spectacle: a bucolic, separate bauble of life. The Circuit will convince you that you don’t leave the world behind as you watch tennis—you bring it with you. Rowan Ricardo Phillips is the author of Heaven (FSG, 2015) and The Ground (FSG, 2012). He is the recipient of a a Whiting Writers' Award, the PEN/Joyce Osterweil Award, and the GLCA New Writers Award for Poetry, and a Guggenheim Fellowship. He lives in New York City.